I have been so fortunate to have met some wonderful ladies when I joined the Cocorico Bee on Flickr. We are just wrapping up the second round and it has been a wonderful journey! Having seen so many wonderful traveling, round robin quilts on the internet, I really wanted to start one. After a bit of coordinating, three members from the original Cocorico Bee created a Traveling Bee. Amy's theme is "Maker" and she started with the sewing machine and zipper blocks. I received Amy's blocks as well as Melinda's additions a few weeks ago. The blocks have been up on the design wall and I have finally added my designs. The first block I made was the iron. 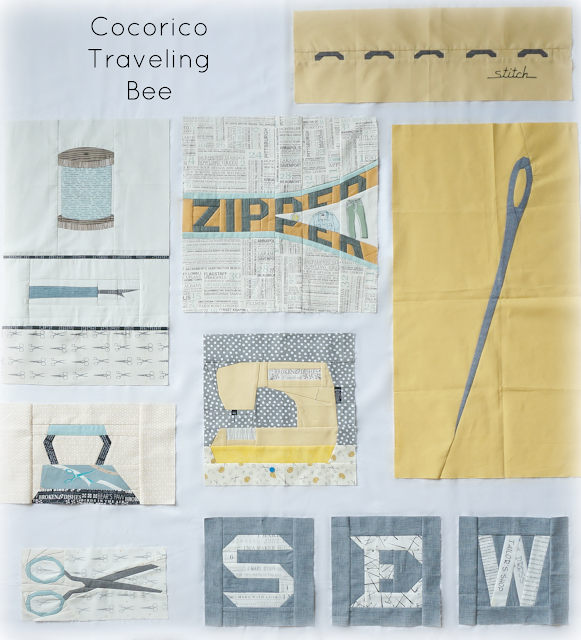 The pattern is part of a quilt I designed for Quiltmaker Magazine a few years ago. The SEW letters are from Kumiko Fujita's book, "Patchwork Patterns 318". 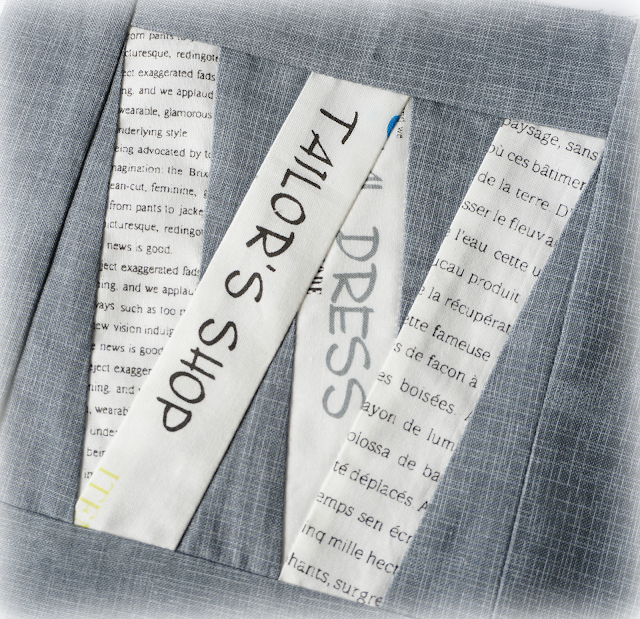 I added my signature style by fussy cutting the word fabrics, isolating my favorite parts of the text. 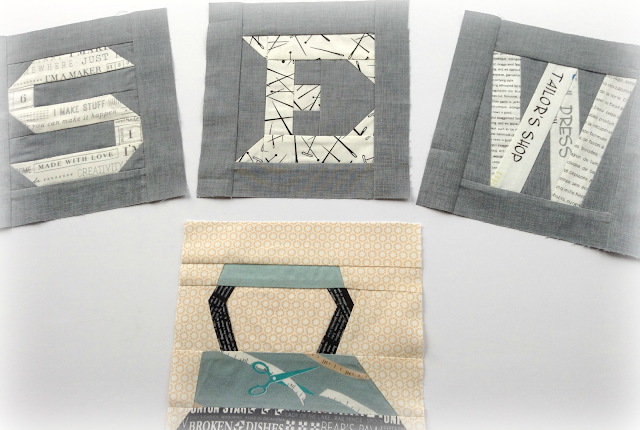 My last addition was the scissors block - a pattern I drafted this week. It has been nice to have all the blocks up on my design wall. helps to inspire the design process. I am not done yet : ) That upper left section that is blank will be filled with a trio of blocks that will balance out the quilt. 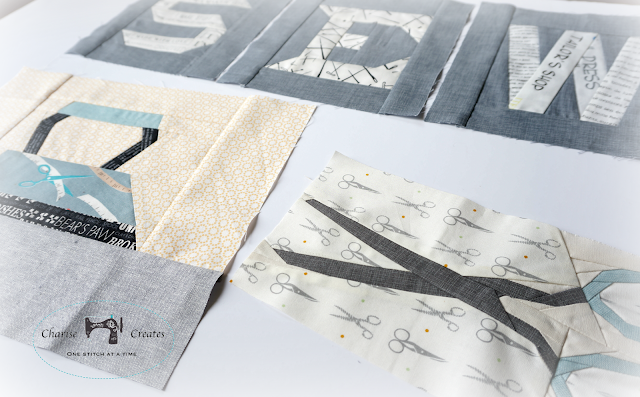 Be sure to head on over Freshly Pieced to see some inspiring WIP Wednesday projects! All blocks are amazing.. but the scissors block is just breathtaking!!! I love your work Charise! This is going to be a beautiful quilt...wow! I really love the scissors block, the shape is gorgeous! I love your additions to this great collection! Charise...this is going to be an amazing quilt. I love the zipper block. These are different colors for you and they are really great together!